Storms ahead? Gear up with these British Military Surplus GORE-TEX® Pants for dependable waterproof, windproof protection from the elements at a bargain price. 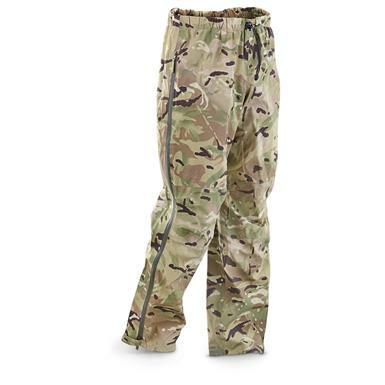 British Military Surplus MTP GORE-TEX Pants, New is rated 3.7 out of 5 by 3. Rated 2 out of 5 by paulk from runs small According to the size chart I should have ordered a XL. I ordered a 2XL to fit over my pants. I couldn't get them on without pants. Rated 4 out of 5 by Leif from Great deal for Gore tex, VERY light with full waterproof zippers. Only concern is after wearing only once there are visible "wrinkles" in the fabric around crotch and knees where you bend. It almost look like when old goretex delaminates or gets cooked in dryer. As long as they stay waterproof i'm happy. Rated 5 out of 5 by Terry from Top-Notch! Good deal for the quality of these pants. Made in England. 100% polyester (Gore-tex.) Appears to be a rip-stop material. I'm 6'1", 190lbs, usually 36W, 32L, and the XL (100cm/85cm) fits perfectly with one-layer under it, and there is room for multiple layers for winter use. Zippers are nice; allows easy on/off, and access to pant's pockets. Name-brand pants of this quality would easily cost a hundred dollars or more, and would probably be made in China. Highly recommend this pant. Wish they also sold the jacket!